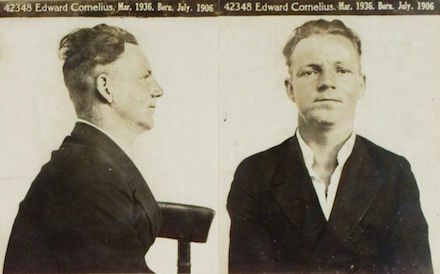 On this date in 1936, Edward Cornelius hanged at Victoria’s Pentridge Gaol for the vicarage murder. The Murder at the Vicarage also happens to be the title of Agatha Christie’s very first Miss Marple novel, published several years before the very real vicarage murder of Rev. Cecil. One lonesome night the preceding December, Cornelius, a mechanic, turned his spanner on the aged head of plain-living 60-year-old Rev. Harold Laceby Cecil of St. Saviour’s — the horrible conclusion to Rev. Cecil’s 18-year ministry in Fitzroy, then one of Melbourne’s roughest neighborhoods. Cornelius’s motive was robbery, and it was hardly the first time that Rev. Cecil had been braced for the few quid in donatives he kept on hand for charity cases. Though undeterred from his mission, Cecil was philosophical about repeated robberies: “I will get them, or they will get me.” According to Cornelius’s confession, it was the getting that got Cecil killed: surprised in the course of a midnight stealth pilfering of the vicarage study, Cornelius grabbed the tool of his other trade and clobbered the intercessor, repeatedly: there would be 17 distinct head wounds discerned by investigators. He fled the vicarage with £8 and few gold and silver trinkets. Some, like a silver watch, he would discard as too incriminating; others, like a gold crucifix, he pawned to obtain ready cash and readier eyewitnesses against him. A death-house chum of similarly notorious Arnold Sodeman — the two passed Sodeman’s last hours on earth together, playing draughts — Cornelius followed the latter’s steps to the same gallows three weeks later.